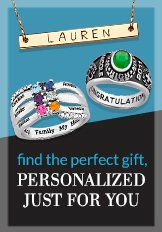 Show off your style with a pair of personalized earrings. Give your outfit a personalized touch with a pair of beautiful Gold over Sterling earrings, featuring your name in elegant script. Add this to your own collection or give it to a friend as a unique gift.